A serious bargain round for the .308 Winchester firearms out there. How many cartridges can say that? If you understand where this ammunition works well, you will be giddy on the range, saving a ton of money and shooting a ton more then the rest of the guys. 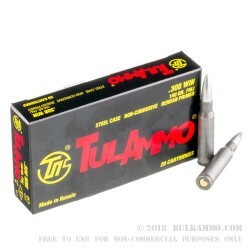 This is a steel casing, zinc plated FMJ round for the .308 with a 150 grain bullet made by TULAMMO. An important note: this is not a match quality round. It’s a shooter quality round with a heavy slant towards heavy semi-automatics with fluted chambers, or with moderate (not ultra tight) tolerances. 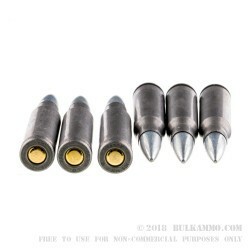 A perfect round for mil-surp like G3’s and L1A1’s and clones, this cartridge really favors an aggressive extraction/ejection cycle, and will perform nonstop if you keep your chamber moderately clean. it’s not perfect. It will require you to know what you are shooting to get the most out of it. And please understand, this is not a hard and fast rule: most guns can shoot this ammunition just fine. It just prefers to be shot with the above considerations. Bolt actions will also gobble this stuff up if you aren’t super aggressive with the feeding on high tolerance chambers. 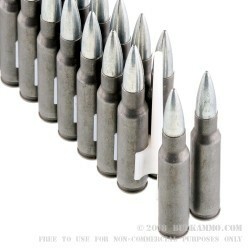 Q: How accurate is this ammo at distances greater than 100 yards do you have the ballistics on this ammo. A: Hello Carlrock, There are many factors in accuracy, the rifle, weather conditions, elevation and the experience of the shooter. This particular cartridge has 2800 fps for Muzzle velocity and 2612 ft lbs of muzzle energy. Q: Is this ammo/primer corrosive? A: No, this Tula 308 ammo is not loaded with corrosive primers. A: Yes, the materials used to manufacture this projectile will attract a magnet.